Our last post explored the unexpectedly robust increase in natural gas storage inventories after the severe winter of 2013-2014 and aggressive restoration’s roll in tamping down on the forward prices for natural gas. For the week of August 13, the Energy Information Administration (EIA) reported that U.S. demand for natural gas had declined by .2% mostly due to the electric power sector decreasing its usage by 6.1% compared to the previous year. The week of August 20, the EIA again reported a .2% decline in usage, as the power sector decreased its usage by 1.3% over the same week in 2013. 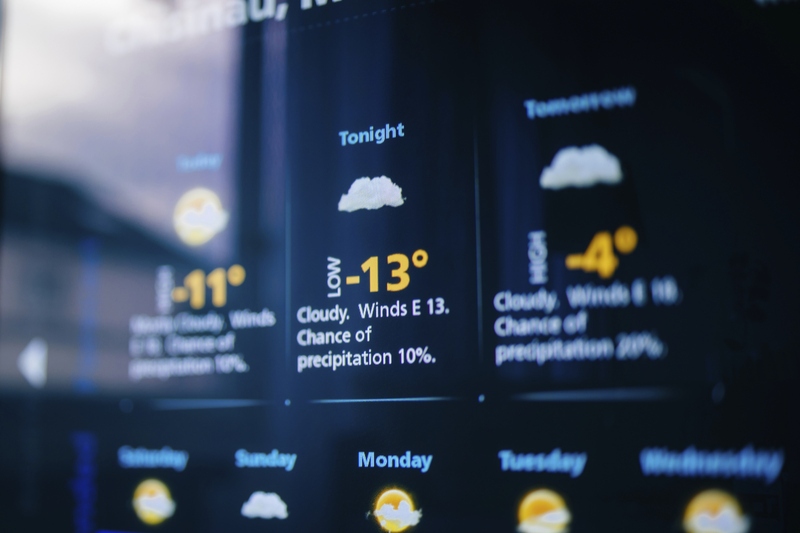 Ironically, the EIA believes that some customers in the Pacific Northwest may have actually begun heating their homes that week due to the cold temperatures. While demand has been stagnant this summer, supplies have grown. The data below shows the percentage changes of this past week as compared to the same week in 2013. While the data only represents one week, the results are consistent with the numbers the industry has seen all summer. Shale gas production continues to lead the supply increase. 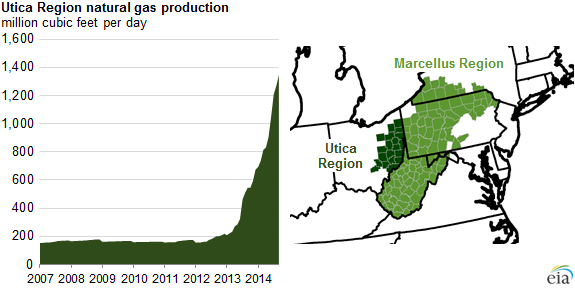 Marcellus area production hit an all-time high in July 2014 as it exceeded 15Bcf/d for the first time. Already the largest shale producing region in the U.S. with 40% of all shale production, Marcellus is expected to continue its growth. By September the EIA estimates that Marcellus will produce 15.8Bcf/d. And now, Marcellus has a fast-growing neighbor in eastern Ohio: the Utica Shale. As of August 12, 2014, EIA now includes Utica’s production in its monthly drilling productivity report. Utica earned this distinction by becoming one of the fastest growing production areas for natural gas in the U.S. The EIA estimates that Utica will produce 1.3Bcf/d of natural gas next month. Current production puts its growth rate on par with the Eagle Ford Region of Texas. Industry experts attribute Utica’s growth to a modest increase in the number of rigs in the area as well as increased production per well as producers have become much more efficient drilling in shale formations. All of these factors – increased supply, lower-than-expected demand due to cooler weather, and rapidly increasing storage reservoirs – add up to lower spot market and forward-looking prices as compared to what was expected by the industry following the harsh winter of 2013-2014. The table below shows spot market prices for the weeks ending August 6 and August 27, 2014, as well as September and October futures contracts for the same weeks. Even though we are three weeks closer to the beginning of the winter season, the numbers for each category has increased very modestly since the beginning of the month. Additionally, prices in the northeastern U.S. have traded below Henry Hub prices since the spring. The basis differential between these two regions has historically favored Henry Hub, however, this paradigm is changing as Marcellus shale gas production, increased gas processing, and greater gas transportation have changed the region profoundly. Eventually, as winter demand in the Northeast increases, the basis differential is expected to reverse, at least through the following winter. As we wait to see how the market responds as the seasons move forward, the great unknown remains the weather. It is possible that despite the herculean effort to restore gas storage inventories, a cold winter could simply draw them down again and gas prices would increase substantially. If the winter is mild, it is possible that spot and forward market gains will be measured, but not grand. Until then, we expect to see more of what we have seen so far this summer – modest gains and losses for the next couple of weeks as long as temperature changes are slight, followed eventually by higher prices as the storage injection season closes and winter shows up on our doorsteps. “Marcellus Shale Gas Production Hits New Milestone,” Cusick, Marie, August 5, 2014, State Impact Pennsylvania. “Natural Gas Slides in Cool Weather,” Berthelsen, Christian, The Wall Street Journal, August 18, 2014. “Natural Gas Weekly Update,” August 28, 2014, US Energy Information Administration. “Natural Gas Weekly Update,” August 21, 2014, US Energy Information Administration. “Natural Gas Weekly Update,” August 14, 2014, US Energy Information Administration. “Natural Gas Weekly Update,” August 7, 2014, US Energy Information Administration. “Natural Gas Weekly Update,” August 22, 2013, US Energy Information Administration. “Utica Production Surged in Last Two Years: EIA,” Ritenbaugh, Stephanie, Pittsburgh Post-Gazette. “Why Natural Gas Was All Over the Place after the EIA Inventory Release,” Parts 1 and 2. Chamberlin, Alex, August 25, 2014, Market Realist. This entry was posted in Natural Gas and tagged Fracking, Natural Gas Markets, Natural Gas Prices, Natural gas supply, Shale gas. Bookmark the permalink.